The Minor Notes series begins today and will run every Monday and Thursday throughout the season. Check back then to get caught up on all the recent news, notes, scouting reports, and other information from the Red Sox minor league system. You can check out the full rosters on the Team Rosters page which will be kept up to date throughout the season. If you haven't signed up for the Forum, you can chat with other readers and SoxProspects.com staff members on a variety of topics, and every morning there is a Gameday Thread which lists the game times, opponents, and starting pitchers for each of the affiliates. The Stats page is currently empty, but this page will be filled with up-to-date stats for all Red Sox minor league players, and it will have the ability to sort and filter those stats. The Transactions page lists all transactions for the season so you can track when players are promoted, placed on injured reserve, or, in some cases, suspended. Pawtucket's roster will be highlighted by Sam Travis and Jalen Beeks. Those two will also be joined by Tzu-Wei Lin after his first taste of major league action last year. Chad de la Guerra, Jeremy Barfield, Chandler Shepard and Ty Buttrey will round out a robust group of PawSox who are all ranked inside the SoxProspects.com top-40. On Tuesday, Portland released their preliminary roster. Michael Chavis (pictured, above) will begin on the disabled list but he headlines the squad along with Josh Ockimey, who will also begin the year on the shelf, and Mike Shawaryn. The Greeville Drive also announced their Opening Day roster on Tuesday. Cole Brannen and Alex Scherff, two of Boston's first five draft picks in 2017, look to lead Greenville to a repeat of their South Atlantic League title. Over The Monster began their round of previews with Greenville on Monday, Salem on Tuesday, Portland on Wednesday, and finished with Pawtucket early Thursday morning. 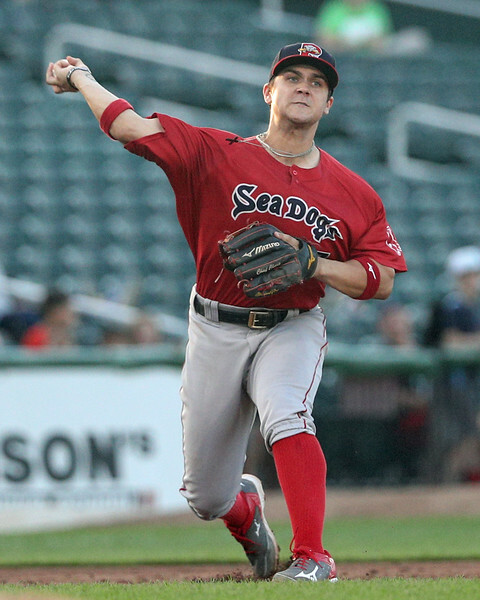 Kevin Thomas of the Portland Press Herald dissected the Portland roster, which will have returning faces, including Danny Mars and gave an overall preview of the team in advance of the Sea Dogs' roster being announced on Tuesday. The Boston Globe's Alex Speier wrote about Houck, who will be donating $25 for each strikeout he registers this year to Tanner Houck's Pitch for Adoption. Jay Groome may be headed to the disabled list to begin the year, but he progressed well in Spring Training and according to Speier, the Red Sox are anticipating a quick return for the left-hander. He will begin 2018 in Greenville. For Baseball America, Speier examined Sam Travis' desire to hit more fly balls and increase his value. Fangraphs ranked the top 19 prospects in the Red Sox system, those who they grade to be 40 or better on the 20-80 scale. MLB Pipeline's Jim Callis outlined where each of his top 30 Red Sox prospects will begin the 2018 season.